Okay, after last night’s episode of The Flash (302, Paradox) I saw some folks speculating that maybe Julian (Malfoy) Albert was Savitar and I freaked out. I love Savitar. I grew up reading Mark Waid’s Flash and, for me, Savitar is sacred as far as villains go. He needs to be portrayed just right. So I figured I would create a sort of Savitar Bible that (hopefully) the showrunners and the writers of the Flash can use. But first, not only is Julian totally wrong for Savitar for a variety of reasons (see below) but most of all we need to stop with the M. Night Shyamalan twists. We’re not going to top the Wells/Reverse Flash reveal from season one and the Garrick/Zoom one felt totally forced and fell flat. So on to Savitar... 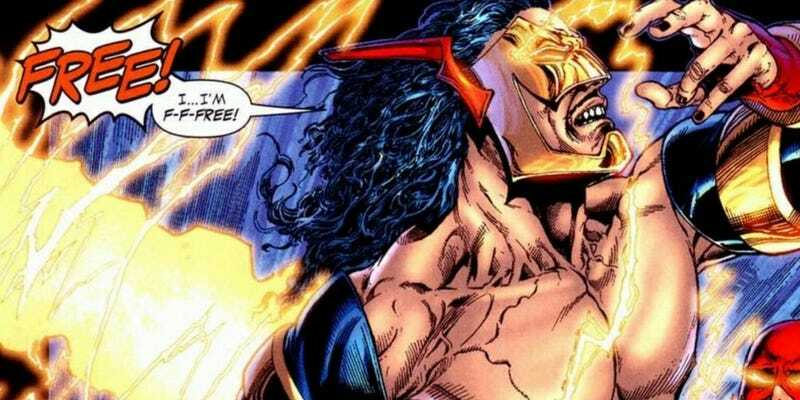 Here are a few characteristics the CW’s Savitar needs to have to be a successful adaptation and a genuinely menacing threat. He should be played by a POC. I think Khan is a near perfect analog to Savitar, highly intelligent, cultured, suave. He’s a cult leader so he should ooze charisma, but most importantly he should be played by an actor of color. In the comic his nationality isn’t stated, but he’s clearly non-white from what looks like a third-world country. He could be from any Latin American country at war with guerrillas or cartels, but since he’s named after the Hindu God of Motion I would cast an Indian actor to avoid Gods of Egypt levels miscasting. There should be a stillness about him. This sounds contradictory, but he’s the master of motion so he can afford to stop and smell the roses, read a good book (or a thousand) in between heart beats. It’ll be a nice contrast to Barry’s running around and fumbling through this hero thing. He also believes himself to be enlightened to the ways of the Speed Force, so just like when Neo slowed down once he woke up to the realities of the Matrix, Savitar would also be in no hurry. He should be measured and in control. Every action is Providence. He should exude power. Darth Vader is also an excellent model for Savitar because our villain is essentially a Speed Force Sith Lord. The way he carries himself, his voice, his musical tag should all say, “You’re fucked now, my friend.” Unlike Zoom’s junkie motivations, Savitar is a religious zealot. He knows he’s absolutely right. Barry and The Flash Family are nothing but heathens. This gives him a confidence no one else, not even Jay Garrick possesses. Star Wars Rebels did a great job of capturing this when they introduced Darth Vader and if a cartoon on Disney XD can do it, so can The Flash. More than anything he should be utterly relatable. Make us hate him and love him all at once! More than anyone on this list, Gul Dukat exemplifies what Savitar should be: cunning, charming, ruthless, self-righteous yet painfully self-aware. Maybe it’s because I read Dead Heat (often) while obsessing over DS9 when I was young and impressionable, but this character should be the prototype the actor and writers use to bring Vicar of Velocity to life.